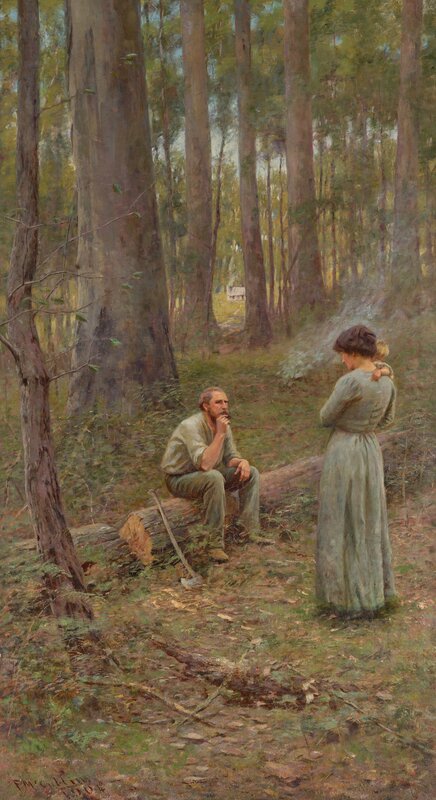 In my last two blogs I have looked at the life of the Australian painter, Frederick McCubbin. I looked at how he started painting and how, in his twenties, he became an accomplished artist who had begun to exhibit some of his work. I talked about the influence some of his tutors had on his art, such as Eugène von Guérard, Thomas Clark and George Folingsby and how he had been influenced by his contemporary artistic friends, Tom Roberts, Arthur Streeton and Charles Conder. However in this third and final blog about McCubbin I want to introduce you to another person who was to have such a great sway on his life and inspire him to even greater things. The person in question was Annie Lucy Moriarty who he had met in 1884 at an artist’s picnic which was being held in Blackburn, an eastern suburb of Melbourne. 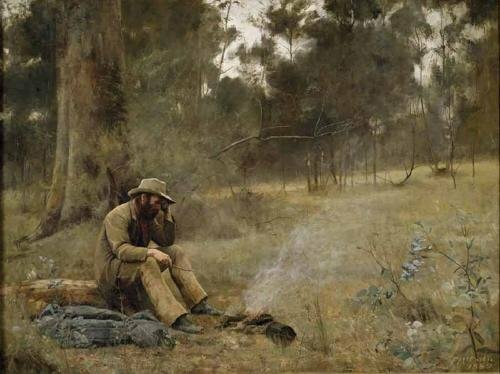 “The Proff” was the nickname Frederick McCubbin had been given by his friends during his student days at the School of Design, National Gallery of Victoria, because of his frequent bouts of philosophising, while Tom Roberts was nicknamed ‘Bulldog’. 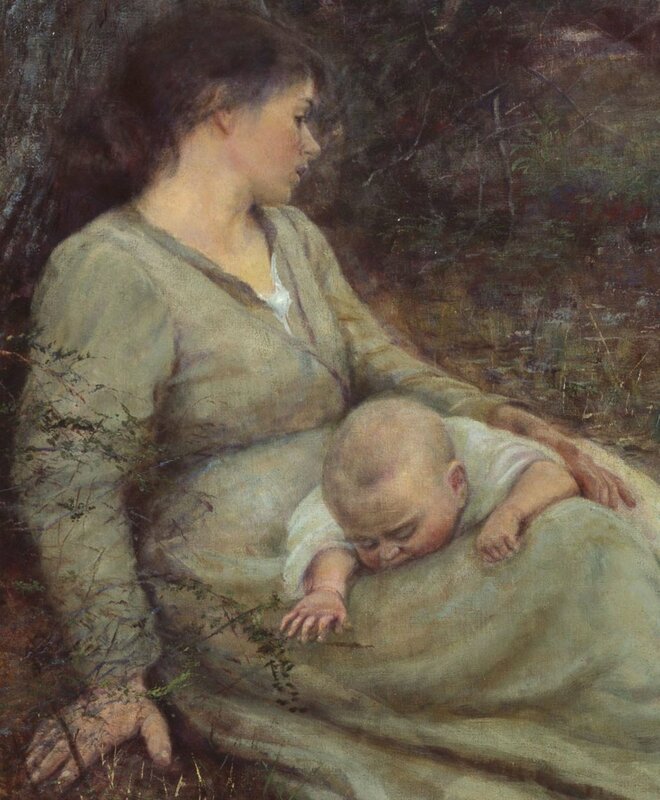 Around this time McCubbin focused a lot of his work on people’s struggle for survival. His paintings were both narrative and social realism works, which told of the struggle new immigrants, had in order to gain a foothold in society. One such painting was entitled On the Wallaby Track, which he completed in 1896. Around this period in the history of Melbourne there was the only too familiar story of “boom and bust”. By 1880 the population of the city was two hundred and eighty thousand. Because of the vastness of the wilderness around the city, it was continually expanding outwards which meant that the area of the city made it one of the largest in the world. Trains and trams criss-crossed the city. Everybody wanted to live in this prosperous area and within ten years the population had almost doubled. Speculators made their fortune on land deals and the banks were lending money out willy-nilly, some would say irresponsibly as if there was no tomorrow and as we have recently found to our own cost, the good life doesn’t last forever. The Melbourne “boom” had to end and indeed it did in 1891 when a dramatic financial crash hit the economy. Thousands of people who had invested unwisely lost their savings, businesses collapsed and throughout the 1890’s it was thought that the Melbourne unemployment was around 20%. The title of the painting derives from the term “on the wallaby” or “on the wallaby track” which fifty years earlier, referred to routes migrant workers took through outlying areas in search of seasonal work. These were the underclass of society, who sought casual work on farms, travelling about on foot, carrying their swag, their bundle of personal belongings, on his back. These were the swagmen. When the financial crash hit Melbourne more and more people had lost their jobs and were searching for employment and it was not unusual to see the swagman “on the wallaby”. In this painting we see a swagman brewing some tea in a billy can over an open fire. 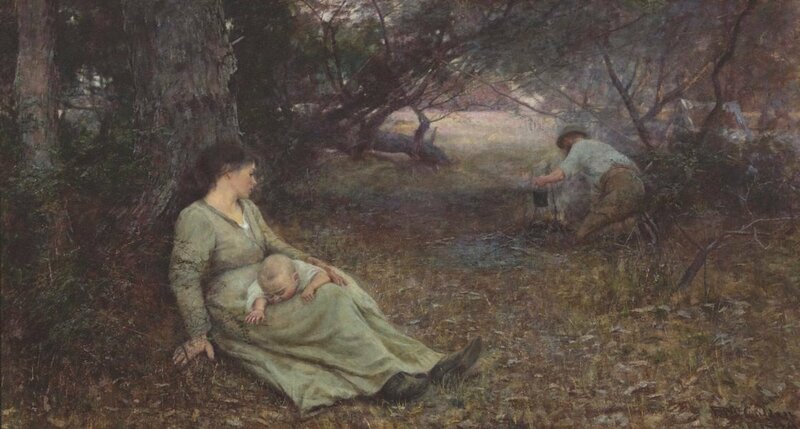 His wife, with their baby, lies on the ground, propped up against a large tree. She is exhausted after the long journey during which she had the added burden of having to carry their baby. The setting for the painting was the forest area close to the Melbourne suburb of Brighton where McCubbin and his family lived. Of all the artists McCubbin studied, his favoured landscape painter and the one who influenced him the most was the French artist, John-Baptiste Corot and it is believed that there are traces of the Frenchman’s style in this painting. Frederick’s wife, Annie, posed for the painting and the baby, who lies asleep across her legs, was Frederic’s son, John who had been born the same year as the painting was completed. The swagman was modelled by Frederick’s brother-in-law, Michael Moriarty. 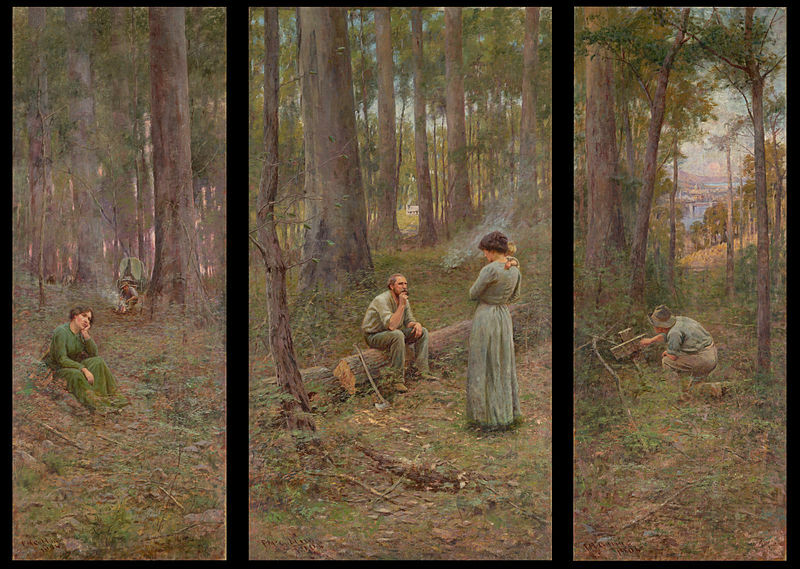 Another of McCubbin’s works I really like is one entitled Down on His Luck, which he completed in 1899. The setting for the work was their Box Hill Artist’s camp and in the work we see a very despondent, down-on-his-luck gold prospector sitting by his camp fire. McCubbin’s friend and fellow artist Louis Abrahams posed for the painting. The prospector sits on a fallen tree and stares into the fire. His search for gold had proved fruitless and he is ready to “throw in the towel”. The McCubbin family had moved about around the Melbourne suburbs. They started married life in a rented property in Hawthorn. As the family expanded there was a need to move to a larger house and so, at the end of 1893, with Annie pregnant for the fourth time, they moved to a larger rented place in Blackburn. Shortly after the tragic death of their daughter Mary, the family moved to an even larger property in Brighton. Annie McCubbin was taken ill with bronchitis in 1900 and this quickly deteriorated into pneumonia and it was on her doctor’s advice that Frederick, that summer, during the Christmas holiday break, took his wife and family away from the polluted atmosphere of Melbourne city life to a small town of Woodened, forty miles north west of Melbourne, where they rented a cottage for a few weeks. Here his wife was able to reap the benefit of the clearer, cleaner air of the Mount Macedon area. One day, whilst the couple relaxed and explored the area near to the summit of Mount Macedon, they came across an idyllic old-fashioned cottage with its red gabled roof and attic windows, which at the time was known as “Dillon’s Summer Residence”. They fell in love with it and its four acres of land and before the end of 1901 they had bought it for five hundred pounds. For them, this was a dream come true and, from that day on, they lovingly referred to their first owned home as Fontainebleau. The one problem they had with this purchase was that it was too far for Frederick to commute by train on a daily basis to the National Gallery of Victoria in Melbourne, where he was Master of the School of Design, and so he spent weekends and holidays at Fontainebleau but during the week he went to live at The Rose of Australia hotel which was being managed by his mother and his two sisters Wilhelmina and Helen. Above Fontainebleau in the bush land of Mount Macedon, there was the estate of Ard Choille, (Gaelic words meaning high wood), which was also the war cry of the 16th century Clan McGregor. It was here that his neighbour William Peter McGregor had built his Ard Choille estate, which was laid out like one of the great estates of Scotland, with its man-made lakes trout amd salmon hatcheries. McGregor had raised deer, pigs and goats as well as importing the finest highland bulls from Scotland and to look after all this he had a number of cottages built for his workers. Frederick McCubbin loved the setting of his new home and the surrounding area and it was here in 1904, on the bush lands of Mount Macedon, just a little above his home that he produced one of his greatest works, The Pioneer. McCubbin painted the work en plein air. The setting for the work is a view of land, Ard Choille thatwas once owned by William Peter McGregor, who died in 1899. The man in the left hand panel of the work, presumably the husband of the lady in the foreground, is making some tea on the open fire. Behind him we see the covered wagon that the couple have travelled in during their search for their piece of land. The decision has now been made. This is their land. In the foreground, the wife sits on the ground. She is lost in thought. I wonder if she is contemplating their move. Has she some reservations about moving to this unconquered God-forsaken territory? Is she worried about the isolation? Frederick’s wife Annie, who was thirty-nine at the time, was the model for the wife in the painting and Patrick Watson, a local gardener was the model for the husband. The baby in the painting was Frederick and Annie’s fifth child John (Sydney) who had been born in June 1896, the year that the painting was completed. In the middle panel of the triptych, the setting is still the forest area of the bush but instead of the covered wagon in the background we now have a small whitewash cottage with smoke emanating from the chimney. The scene is a step forward in time for the two intrepid colonists. They have staked their claim on the land and built themselves a cottage. The cottage in the painting was one which was actually on McCubbin’s neighbour’s property. It was the cottage which belonged to McGregor’s manager, who looked after the estate’s prize bulls. Although we have jumped ahead in time, the three characters we see in this middle panel are the same ones who featured in the left hand panel – the free selector, his wife and son. The free selectorin this painting was modelled by James Edward, a professional commercial artist, who was known to McCubbin. He is sitting on a tree, which he has just felled, and the area seems more open, highlighting the clearance work the free selector had accomplished. Annie McCubbin once again modelled for the free selector’s wife and as a sign of the passage of time, the baby we saw in the left hand panel has now grown to a young boy which we see her holding. The boy was modelled by Jimmy Watson, the nephew of Patrick Watson who posed for the husband in the left-hand panel. The wife in this middle section seems more relaxed and maybe all her worries she had when we saw her in the left–hand panel have now proved to be unfounded. There is a very relaxed and contented aura about the depiction seen in this middle panel. The couple had come to the bush, seen it and conquered it. The right hand panel of the triptych is more of a mystery. Time once gain has passed since the depiction in the middle panel. In this painting there is just a solitary figure kneeling before a wooden cross in the ground. Patrick Watson once again modelled for this figure. It seems as if he is touching it lovingly. McCubbin would never explain the meaning of this last panel so it is up to us to form our own ideas. Could it be the son we saw being cradled by his mother in the first two panels returning to his mother’s or father’s grave or it could it be earlier in time and it is the free selector we saw in the other panels come to pay his respects to his late wife. All we do know is that a lot of time has passed since the depiction in the middle panel for where there was once a solitary cottage in the background, there is now a vista of a city to be seen through the trees. The minute cityscape had not been in the original work when it was exhibited in his one-man show in 1904. 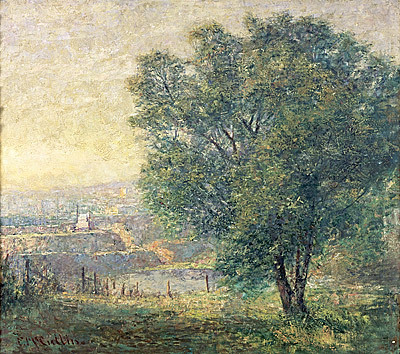 The painting did not sell and McCubbin’s friend, Walter Withers suggested to McCubbin that if he painted a view of Melbourne in the background of the right-hand panel then it may find a buyer. 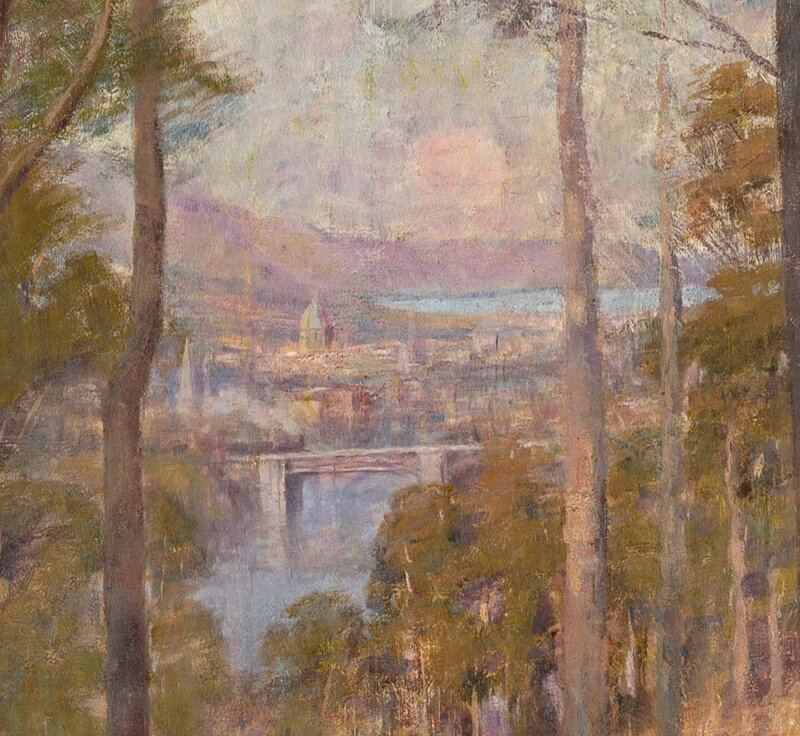 McCubbin added the view of Melbourne and, sure enough, the painting sold. The buyer was the National Gallery of Victoria. The fascinating fact for me about this work is that to paint it outdoors, McCubbin had to dig a trench in his garden, into which he lowered the huge canvas. In May 1907, a year after his last child, Kathleen, was born, McCubbin set off on a trip to England where it gave him a chance to be reunited with his brother James. James, who was a ship’s purser, was killed eight years later in May 1915 whilst serving on the passenger liner, S.S.Lusitania, when it was torpedoed by German U-Boats. Frederick also met up with his artist friend Tom Roberts who was based in London and the two of them toured the city’s art galleries. McCubbin was impressed with what he saw, especially the works of Turner which would influence his later works. He returned home in November. A month after returning to Melbourne, whilst still retaining their family home of Fontainebleau, he rented Carlesberg, a colonial-style house in South Yarra which had a vast garden which culminated at the banks of the Yarra River. I hope you have enjoyed my last three blogs charting the life of this great Australian artist and that I have somehow enticed you to visit the Australia exhibition at London’s Royal Academy where you will be able to stand before the amazing painting, The Pioneer. Hi im intereated to know i have the pioneer painting in a frame with description on back also each panel singed and date 1904 is this worth any thing or is it one of meany signed.? Thank you. Thank you so much for the wonderful read. Frederick McCubbin is my favourite artist and the prints, yes for some unknown reason each is framed individually, of The Pioneers, has hung in our house since my husband & son presented them to me one Mother’s Day almost 4 decades ago. They are very dear to my heart. My husband has spoken of replacing them a few times as they have faded over the years but I am reluctant to do so for sentimental reasons as well as I see the fading as part of their charm & for me it tells a story. As with the story of The Pioneers, my prints have changed; memories fade but I seem to remember the pertinent parts which are special to me. Life has changed over the years that they (The Pioneers) have been with us, there are similarities with our own story. Our landscape has also changed as forests have faded into housing estates. An unfortunate necessity of life. My Mother had an Aunt by marriage who attended the Heidelberg School & I have a small oil painting of hers which is another link to Frederick McCubbin for me. I attended a funeral today in my hometown of Toowoomba for a dear family friend. It was held at Burstowes Funeral Chapel in Ruthven Street. At the Wake after the service my elderly parents noticed the print of a painting on a wall which looked familiar. They asked me if I knew who was the artist. I found the signature but couldn’t identify all of it, F Mc was all I could decipher. When I came home I started some research on my IPad and found your wonderful and extensive information about artist Frederick McCubbin. It helped me put the pieces of the days puzzle together. The Wake was held in a room called, ‘The Pioneer Room’ and the print of the painting on the wall was ‘The Pioneer’. When next I talk to my parents I’m sure they will be like me and appreciate the information from your wonderful article about Fredrick McCubbin. Thank you.